Updated randomly, this webcomic comic doesn't contain anything from our book!!! The crazy car cartoons and caricatures of the late 60s always had that sense of fun and I combine the influences of Ed "Big Daddy" Roth, Dave "BIG" Deal with a broader range of vehicles and add jokes and edutainment. Ed Roth, or rather the work of Ed Newton was about rebellion, and had all the tire smoking blown cars driven by crazy monsters in the early days. They started the T-Shirt craze and also had decals, stickers and other merchandise. The monsters vanished in later years to be leave just the Rat Fink character. The cars were usually of the muscle car or hot rod variety. Dave Deal had a gentler approach to caricaturing cars and usually had people in the scenes as well. He also included sports car CAN-AM, drag and off road racing and vehicles in his work. Even a Ferrari or two, along with the '32 Fords and '57 Chevys. And of couse we do custom Car Cartoons, Business Logos and Graphics to your requirements. We have made it for the Kindle. 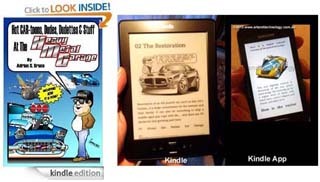 However, the Kindle reader is not just an electronic tablet, but a free application you can use on any computer or tablet you have, including your Smartphone. Even for the iPad, iPod and iPhone. Do yourself a favour and check out the free sample of our book at Amazon, and the free eReader for yourself. 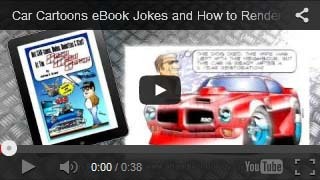 Hot CAR-toons, Dudes, Dudettes & Stuff At the Heavy Metal Garage at Amazon for $3.99. CAR-toon jokes and behind the scenes stuff. The book is purchased from within the Kindle Reader or at Amazon, and you will have it in minutes. Along with the cartoons, we have a behind the scenes "how to draw" section explaining our version of CAR-tooning, Vector Drawing and Digital Painting. This shows how we go about doing these illustrations and how reference photos can be used and all that stuff�..
And have a look at the ever changing Heavy Metal Garage gear at the Online Store. Copyright � 1995-2014 Adrian S. Bruce, Art & Technology. All rights reserved. Sydney Australia. No reproduction is permitted without explicit written permission.